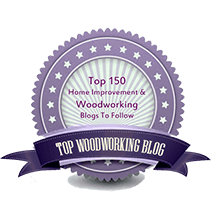 Heartwood » Blog Archive » Is this safe? I injured myself earlier this year doing a procedure in the shop that I knew full well was not safe. A story familiar to woodworkers, I thought it would be OK, just this once. I fed a short piece into the thickness planer which ejected it faster than an baseball umpire tossing a manager who kicks him in the shin. A corner of the wood hit the tip of my thumb creating a handsome gash. Funny thing, I saw the blood drops on the floor before I felt the pain. Not OK. I was lucky, however, especially considering that my thumb at the moment of impact happened to be at the midline of my body, directly in front of, ahem, valuable anatomical parts. After a fun-filled trip to the emergency room for some embroidery on my wound, I did some stern attitude adjustment. I posted this sign at the outlets where I plug in all my machines. It tells me what I must first ask myself when doing procedures in the shop. I taped the hospital ID bracelet to the sign (for the photo, the blue tape covers my medical record number) to remind myself that bad stuff happens and it could have been a lot worse. Machines are dumb, it’s the human who is supposed to be smart, I got it. Let this be my first and only significant woodworking injury. 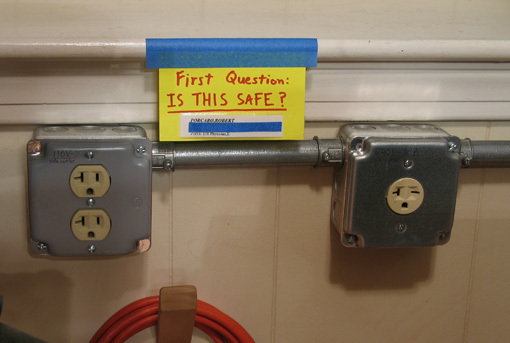 Perhaps post a sign in your shop, without the bracelet – and without the injury. Happy woodworking. « Need a new tool? Sure!